Sure, these days you're all into your iPod, but a generation or so you would have been all agog about your new, state of the art transistor radio. These days it's hard to even find a transistor radio, but they used to be the pinnacle of consumer design and electronics. Sarah Lowrey is keeping the memory of the transistor radio alive, with an astonishing collection of more than 1,000 models, all photographed and catalogued on her website. It's a tremendous window into mid-century industrial design. Check it out at transistor.org. All my photos are high quality and are accompanied by details (facts and figures) and comments. Feel free to visit. Thanks. 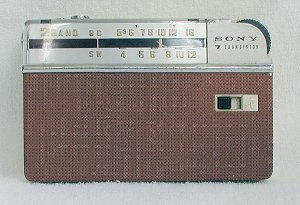 That Sony radio you are showing above is the first shirtpocket sized AM/SW (shortwave) transistor set...very collectable.